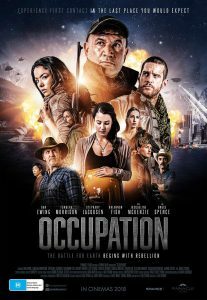 A brand new poster has been unveiled for the sci-fi feature Occupation, which follows a group of residents who must stick together to survive after an alien invasion. They soon realise that they must band together to create a rebellion, taking back what is rightfully theirs. The Australian flick comes from director Luke Sparke, who previously directed 2016’s horror-comedy Red Billabong. The film stars Temeura Morrison, Dan Ewing, Stephany Jacobsen, Rhiannon Fish, Charles Mesure, Bruce Spence and Aaron Jeffrey. Check out the poster below, it certainly gives off a Star Wars vibe. Occupation will be released in the USA in 2018.